국동에는 품질 검수를 하지 않는 바이어가 있습니다. 바로 나이키입니다. 업계에서 나이키를 생산하는 기업이라는 것은 많은 것을 의미합니다. 공장은 완벽하게 셋업되어 있으며, 생산시설과 프로세스는 효율적이고 체계화되어 있고, 종업원의 인권과 복지를 지키고 생산국의 환경은 훼손하지 않는 등 사회적 책임을 준수하는 기업이라는 뜻이기 때문입니다. 국동은 나이키가 자체 검수 authority를 준 기업 중 하나입니다. 검수하지 않는 다는 것은 보다 완벽할 것을 믿고 기대한다는 것입니다. 그 기대와 믿음을 져버리지 않기 위해 국동은 바이어의 요구사항 그 이상의 품질을 위한 노력을 늘 게을리 하지 않고 있습니다. 기술사업능력 등에서 우수한 평가를 받은 기업에게 수여됩니다. 국동의 회사ㆍ제품ㆍ기술의 우수성을 모두 인정받은 것이라 할 수 있습니다. · No Inspection By The Buyer. Kudong isn’t satisfied to meet basic industry standards set by governing entities such as CTPAT, VF PRIDE, NATIFIC , NICE, etc. At Kukdong, we are constantly striving for and achieving quality above and beyond standard expectations. The greatest show of confidence a buyer can give Kukdong is to not send auditors to our factories. Nike is one such company. As a customer, Nike trusts Kukdong to perform our own quality inspections on their orders. Nike believes that our facilities are set up to fully meet their requirements in an efficient and systemized manner; that our company respects human rights and has concerns for the welfare of our employees; and that we do not undermine or cause detriment to the environment. 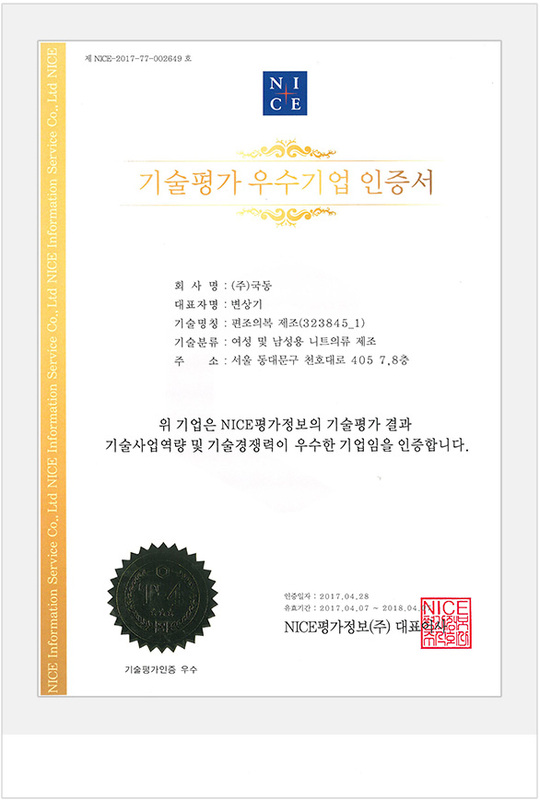 NICE Technology Evaluation Excellent Enterprise Certification is awarded to companies that have been evaluated in the areas of technology, market competitiveness, and business ability. Kukdong received recognition for excellence in all these categories.